Lisbon’s spectacular new cruise ship terminal, designed by João Luís Carrilho da Graça is the city’s new landmark building. 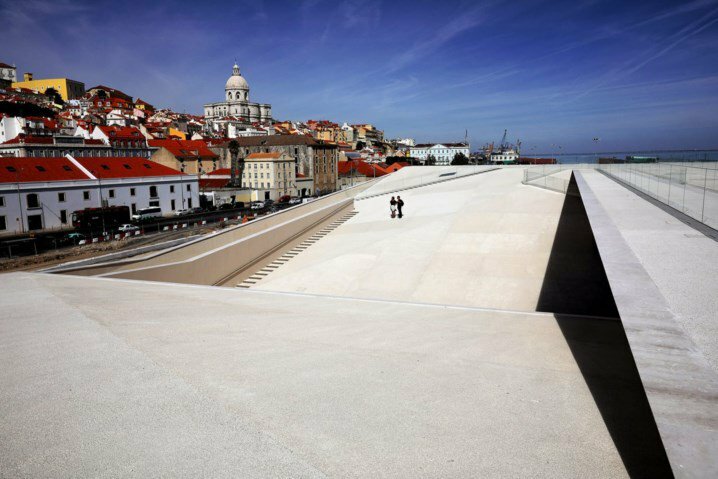 It’s a must-see for anyone interested in architecture tours in Lisbon. Opened this fall, this is a monumental, yet incredibly light masterpiece designed to welcome visitors who arrive in Lisbon by ship. In the building, a special composite that mixes concrete with cork was used to create the structure, which weights 40% less than regular concrete. The building, covering an area of approximately 13,800 square feet, was designed with comfort, accessibility and flexibility in mind. It offers a striking first impression of a vibrant city which has been voted Europe’s Leading Cruise Destination. Another iconic project recently added to the list of Lisbon’s architectural gems is the EDP headquarters building. Designed by architectural tandem Aires Mateus, its sturdiness and monumentality are not incompatible with lightness. A glass, steel and concrete structure is etched with vertical elements. An ever-changing facade varies with the light, half-light, or shadow, and changes from more opaque and mysterious, to more transparent, revealing the light pulsating within it. The gesture resolves the project, protecting working space, creating courtyards in section, and public functions within the horizontal square. Seen from the river, the architectural promenade is like a slow travelling movement. The building is even more spectacular, as the volumes seem to float, imbued with ethereality. Also commissioned by EDP is Maat, Lisbon’s new star Museum of Art, Architecture and Technology. Opened in October 2016 it was designed by British Architect Amanda Levete. Maat is a striking work of contemporary architecture, and surely one of the top buildings to include in a tailor-made architecture tour in Lisbon. One of the most striking aspects of the new Maat Museum is the relationship the building establishes with the river. Built on the bank of the Tagus River, the organic, futuristic Maat Museum is deeply connected to its surroundings. It literally creates a bridge between the riverbank and the rest of city. The top of the building is a generous belvedere open to the river. In the Belém area, the Champalimaud Foundation – Center for the Unknown magnificently explores the relationship the city has to the river. It’s an organic design by Indian architect Charles Corrêa which creatively mingles a sense of mystery with an incredible openness. This building has been defined as “architecture as sculpture” and responds to the need of creating a flourishing atmosphere for the research in biomedicine undertaken at the Foundation. On the western side of the city, Parque das Nações, a group of architecture masterpieces awaits the visitor. This once forgotten are was renovated for the Expo 98 and since then it has been the center of the city’s most cutting-edge architecture. On top of the list is Alvaro Siza’s beautiful Pavilion of Portugal, with its subtle elegance and power, so beautifully expressed in the trademark concrete canopy floating over a 2000 square feet square. Another icon of this area, and the city of Lisbon is Santiago Calatrava’s Oriente Station. Lisbon’s Oceanarium, the city’s famous aquarium, was designed by Peter Chermayeff and is one of the icons of the capital. This area of the city is still the heart of an ambitious project that reconfigures the urban landscape, and a new residential project by renowned architect Renzo Piano, in Marvila, is currently under construction. Yet another emblem of this spectacular renaissance to discover in our architecture tours in Lisbon.